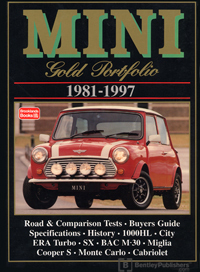 This Mini Gold Portolio: 1981-1997 is a collection of 45 original articles compiled from the pages of Australian Motor Manual, Autocar, Autosport, Car-South Africa, Cars & Car Conversions, Motor, Motor Manual, Motor Sport, and Wheels. The information collected in these reprinted articles includes 20 road and track tests, plus specifications, touring and long-term reports. This book follows from our previous volumes in chronicling the models of the popular Mini introduced in the late 1950s. That it was still in production in this period says much a devoted following. Of course updates have occurred which have kept the rejuvenated model up to date. During the British Leyland period and then went on to wear Rover badges when BL changed its name in the middle 1980s. This is a book of contemporary road and comparison tests, specification and technical date, new model introductions, long-term tests, history, buying second hand, rallying and racing.